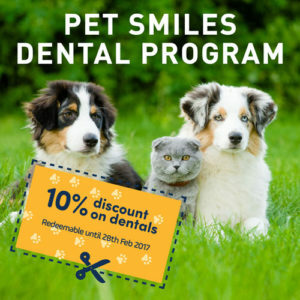 Discount on Pet Smiles Dental Program! 10% Discount on Pet Smiles Dental Program redeemable until 28 February 2017. Warrnambool Veterinary’s Pet Smiles Program is aimed at preventing a common, debilitating and painful condition in our pets. 70 to 80% of our pets over the age of 3 have evidence of tooth and gum disease. By receiving a preventative tooth cleaning (called a “prophy”) each year, your pet is far less likely to develop problems at all. We know from human research that people with rotten teeth die younger. The same applies to pets. So it is not an exaggeration to say that you are potentially adding years to your pet’s life by regularly cleaning its teeth. What’s included in our Pet Smiles Program Full veterinary pre-operative health assessment. General anaesthetic including intravenous fluids. Charting of the mouth to look for tooth decay, pain and mouth cancers. Advice on home-care to keep that smile sparkling. Your pet must have no worse than grade 2 dental disease this means tartar or early gingivitis. If your pet has more significantproblems then our regular charges will apply. Your pet must be otherwise fit and healthy. If your pet has other problems that might affect the anaesthetic the vet will decide if this program is suitable. To take advantage of our 10% discount call our friendly reception team and book your furry friend in for a dental today.